Over the last 20 years in Lima, a mechanism for self-organization of the public transit system has emerged. The buses and microbuses follow no schedule. Instead, self-employed Data Guys (Dateros, in Spanish) monitor the buses from different lines. 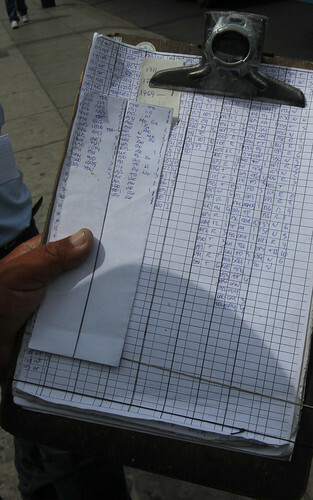 They register the times at which the buses cross their point, and sell this information to the co-pilots of the buses for around $0.10, ten cents of dollar. The Data Guys also monitor whether the buses are full, half-full or empty. Thanks to this information, each bus driver can evaluate whether he is late or early, and based on that evaluation he chooses his speed and timing for the way forward. If he is late, he may be surpassed by the next bus, and the next bus will get the passengers that are waiting for his bus. If he is too early, he will not find enough passengers to fill his bus. So, he has to pay attention to this information in order to maximize his passengers. This mechanism of self-control began in Lima in the 1990s, then it propagated to other cities in Peru, and now (according to the Data Guy) it is also being applied in Chile and Colombia. The system is not perfect. Sometimes two buses engage in real races in the streets, competing for passengers. These races increase the risk for passengers, for other cars and for pedestrians. However, most bus-drivers find this system more adaptable than the rigid schedules defined by the city. Photo and post by Sebastiao Ferreira. This post is number 4 of 52 in Sebastiao’s 52-week photo journal. indeed they are ubiquitous — although in recent years not informal anymore — like many peruvian industries they have formalized. I think the ‘dateros’ of the outer edges of the city may still be informal. and lima-based art/tech/society groups are all over it, of course, referring to them as a natural database, an ‘informal bank’ of transportation optimization data. one project (run by La Factura and Ciudad Nuestra), called “we are all dateros” solicited text-message contributions by commuters in order to influence the schedule and station planning of the recently built bus rapid transit system, the Metropolitano. I remember when they started, in the 1990s. They were not ubiquitous and they have no uniform. Now they are ubiquitous in Lima, the city is aware that they exist, and they wear an uniform. Although, some of then are hired by some lines, most of their income depends on voluntary payment from the bus-drivers with no contractual responsibility. Is it enough to say that they are formal? How do you define formal? I remember these dateros from when i lived in Santiago, Chile in 2003. There are also a range of body gestures that they use to signal to bus drivers that the next bus is full, half full or empty. 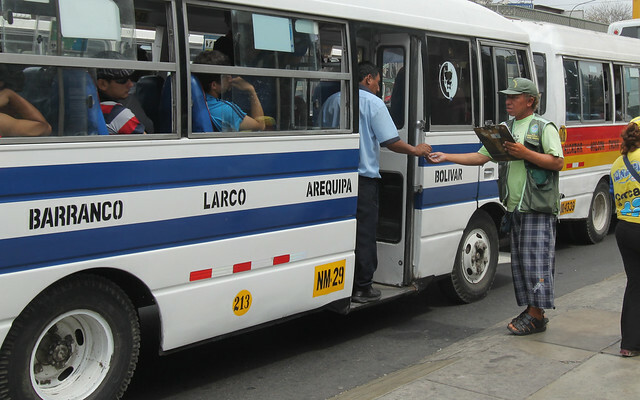 I used to love riding the Santiago “micros” just to get a glimpse into this complex and unique bus culture– from drivers, assistants, inspectors to vendors. Santiago switched its bus system to a government system under Bachelet. I wonder where these dateros ended up going after that. I bet this approach eliminates the dreaded ‘bus-bunching’, or 2-3 buses running one directly after the other on the same route when they should be spread out. The No. 1 bus in Boston always has that – 30 minutes with no bus, and then three show up at once. Sebastiao, do you know if the Datero approach makes the bus system more efficient? Because I was using public transportation for a couple of weeks, I could observe the behavior and the mind set of bus drivers. It is very simple. They want to maximize the number of passengers in their bus. If they are a bit late they get more passengers, but if they are too late they can be surpassed by the next bus. If this happen they lose passengers. So, it is a question of ambition and risk management. The result for the public is that they have to distribute evenly the time among buses to reduce risk of losing passengers. The conditions of transit in Lima is so uncertain that to operate based on schedules is not viable. This system is annoying some times, but the cost of transportation in Lima is notably lower than in other capitals of South America, benefiting low income people.